WBC flyweight world champ Sonny Boy Jaro (left) and his taller Japanese challenger Toshiyuki Igarashi made their weights ahead of their title clash later today in Kasukabe, Japan. 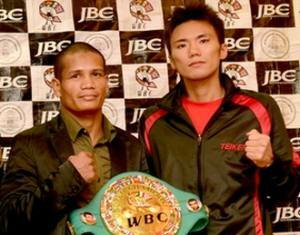 Japan's Bangoku Gurentai reported that Jaro, 30, made his weight in his second attempt. In the first try he was 500g (1.1 lbs) over the limit of the flyweight division (50,800 kgs, 112 lbs). Jaro's second check was successful. The clash will be Jaro's first defense of the prestigious WBC green/golden belt that he shockingly snatched from veteran former champ Pongsaklek Wonjongkam last March in the Kingdom of Thailand, and this is a mandatory defense. Today's combat will mark Sonny Boy Jaro's 50th professional fight as the Rizal born fighter has won 34 times, against 10 defeats and 5 draws. 24 of his victories by way of KO. Regardless of Jaro's seven defeats by knockout, the Pinoy is a going-forward engaging fighter who stalks his enemies with an aggressive stance supported by overheads and hooks which he throw constantly while pressing for the match to be a close quarters combat. That was the fighting mode that made him victorious against the experienced Pongsaklek Wonjongkam, who prior to the fight received the prestigious WBC fighter of the decade award. Prior to his fight with Wonjongkam, only Jaro's manager and family had faith that he could pull the big win, and he did not disappoint; the awesome feat resembles the inspiring triumph James Braddock, a burn out semi-retired fighter who rise from harshest times to become a champion of the world. A modern day Filipino Cinderella man, Sonny Boy Jaro is now the reigning, defending WBC's and Ring Magazine flyweight champ. Meanwhile, Japanese flyweight champ and mandatory challenger Toshiyuki Igarashi (15-1-1, 10KO's), a southpaw two years younger than Jaro, is a speedster with good boxing skills in his first title shot. His last fight was a 12-round unanimous decision victory over tough Mexican Wilbert Uicab last November in Tokyo. Toshiyuki Igarashi represented his country of Japan in the 2004 Olympic Games in Athens. As an amateur, he amassed a record of 77 wins (16 KOs) 18 losses. After the Olympics, Igarashi graduated from the Tokyo University of Agriculture and turned pro fighter in 2006. His only defeat as a professional was a split decision loss to fellow Japanese Tomonobu Shimizu, a former world champion. Igarashi is trained by Japan's former national champ Yūichi Kasai and is promoted by Japan's top fight company, Teiken Boxing.